In the 18th century, if you had a problem with large, possibly man-eating felines cruising around your farm, then a phrase like, “knorhoek” or “the place where lions growl” would seem quite fitting. 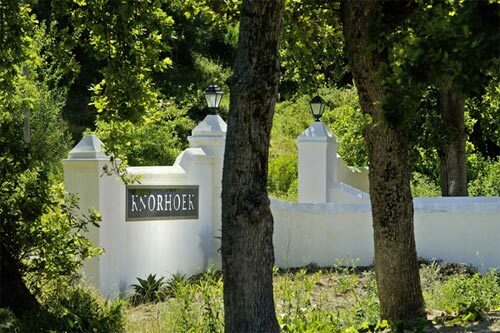 And this is how Knorhoek winery took its name several hundred years ago. Weathering many a storm (such phylloxera) once the danger of predatory cats were wiped out, they’ve gone on to be a wonderfully scenic winery producing great wines from the region. And despite there being no more leopards in the area, they still thought it fitting to put on one the label. Down a seemingly endless small road, you eventually cross a small stream and dead-end in to Knorhoek. The winery sits at the edge of a heavily forested area and indeed feels quite wild. Despite this feeling, they have 105 hectares of grapes that are largely sold to other wineries. They produced their first wine in 1997 and host many weddings on the grounds with people often staying in their country guesthouse.